Born in Tenby in 1878, Augustus John studied at Slade School of Art, London, under the influence of Henry Tonk. He was considered the most famous British artist of his day. He taught at Liverpool University of Art before becoming a war artist in the First World War. Never short on patrons, John became a fashionable celebrity artist cultivating the image of the wild and free artistic spirit, drawing inspiration from the gypsy lifestyle and culture. 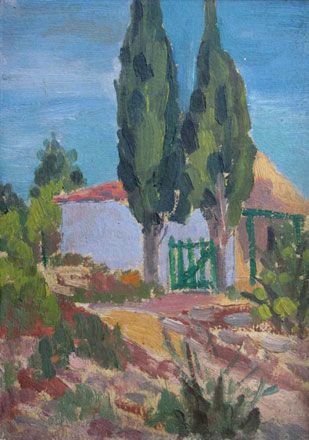 Although a highly competent landscape artist, greatly inspired by James Dickson Innes, John's forte was his portraits, sketching and painting fellow artists and bohemians, writers and his family. As famous for his bohemian lifestyle and flamboyant personality as he is for his brilliant figure drawing and portraiture, Augustus John is regarded as one of the greatest draughtsmen of the 20th century.